Not too long ago, I went on a camping trip with my extended family. At one point, my dad tripped and ended up with two puncture wounds in his leg. We administered first aid, got him in the back of my car and drove him a little more than an hour to the nearest emergency room. Before we left, my mom had the presence of mind to quickly grab my dad’s insurance card. Dad needed stitches, but we made it back to camp (at about 2:30 am) and he was able to enjoy the rest of the trip (with the help of some pain killers). If you plan to travel, it makes sense to prepare what you can to take care of your health while you travel. Whether you are traveling in-country, or heading overseas, you need to have an idea of what’s covered, and how to get the care you need. One of the reasons that we buy a policy from our current insurance company is that it is a well-known company with in-network health care providers all over the country. Whether we’re visiting my parents in Idaho, or my husband’s parents in New York, there are in-network health care providers nearby. Check with your insurer to find out where the in-network providers are. You can usually use out-of-network providers, but you will have to pay a larger portion of your care in those cases â€“ and some insurers won’t cover out-of-network care at all. Make sure that you thoroughly understand the policy â€“ and where you can get care â€“ ahead of time. In my dad’s case, the emergency room doctor just gave my dad enough pills to get him through the camping trip and told him to follow up with his own doctor upon returning. In many cases, if you are traveling, it’s possible to get a prescription filled at the hospital pharmacy, or take the prescription to a local drug store. If you know that you will be traveling, though, bring your medications with you. If you know that you will need a refill while you travel, you can ask your doctor if it’s possible to get the refill early. The doctor might need to clear it with your insurer and the pharmacist, so make sure that you make arrangements ahead of time. Then you can take your medication with you. In some cases, you might not be able to refill early and take the medication with you. In those cases, find out what the policy is. You might be able to take a prescription to a local drugstore. Talk with your health care provider and your health insurer well ahead of time to find out what your options are. In many cases, your health insurance policy won’t be sufficient when you travel overseas. When I was a foreign exchange student in Austria, my parents worked with my health insurance company to make sure that I would be covered, and they also got evacuation insurance that would pay for me to be flown to the States if necessary. Many health insurers offer special products designed to help you when you travel overseas. Find out what those products and services are, and find out what, exactly, is covered. Also, if you are going to be doing some adventuring while you travel, consider getting emergency evacuation insurance. You might also want it anyway, so that you cover transportation back home if necessary. When you know that you will be traveling, and that you might possibly need health care while you are gone â€“ especially if you are traveling internationally â€“ speak with your health insurer and your main health care provider to ensure that you are properly prepared. Do you travel frequently? 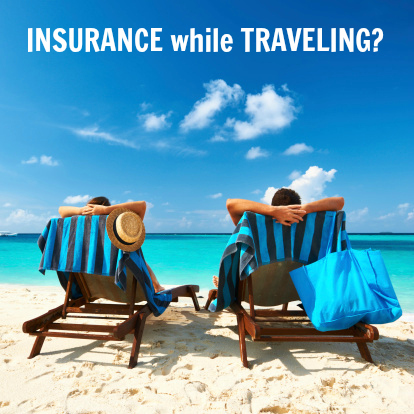 Do you KNOW you’re covered with insurance while traveling?